Veterans associations, such as the Student Veterans of America (SVA), American Legion, Military Order of the Purple Heart, and Vietnam Veterans of America (VVA), are working to amend Title 38 of the U.S. Code, specifically regarding the Post-9/11 GI Bill. 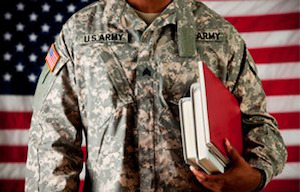 The associations want to revise the Post-9/11 GI Bill so that it benefits a wider range of veterans who are transitioning into higher education or future careers. Some draft bills for the GI Bill were introduced to Congress in late April, including measures such as the Veterans Education Equity Act, which eliminates the Basic Allowance for Housing (BAH) so veterans can make their education decisions based on factors other than housing benefits, such as where they attend their classes. Those proposed bills passed the House of Representatives, but stalled in the Senate. Some were not even brought to the House floor for a vote. The SVA and American Legion held a Post-9/11 GI Bill Roundtable Discussion on May 18 to discuss improving the GI Bill, inviting more than 60 veterans and military service organizations, stakeholders and media to the American Legion office in Washington, D.C.
Hubbard said the SVA will be hosting a follow-up discussion on June 6 in hopes of figuring out how to get to the next step in the amendment process. Two weeks ago, the American Legion released a report along with the Department of Defense, Veterans Association and other stakeholders, called The State of Credentialing of Service Members and Veterans, which lays out blueprints as to what’s currently successful for vets and what they want to see improved. The SVA has also recently published findings from its long-term research project, NVEST, or National Veterans Education Success Tracker, which was completed in partnership with the National Student Clearinghouse and VA. They studied the modern student veteran’s academic progress and completion rate to help distinguish how well the GI Bill’s Return on Investment (ROI) benefits all types of veterans. The SVA, American Legion, and other veteran’s associations and stakeholders are continually lobbying Congress to empower the VA to conduct its own research on the GI Bill. “As a result, VA is now nine years into its 20-year longitudinal study on vocational rehabilitation benefits, which we lobbied Congress in 2008,” said John Kamin, assistant director for the American Legion. One thing that all of these veterans’ organizations have in common is making sure transitioning veterans, whether they are going into higher education or a full-time career, are taken care of. “We are in this to make sure this generation and future generations of veterans are set up for success and so they’ll get what they earned when they made their sacrifices in serving in the military,” said Kristofer Goldsmith, Assistant Director for Policy & Government Affairs for the Vietnam Veterans of America. Vietnam Veterans of America has two priorities in improving the GI Bill. One is to end the 15-year delimiting date, which causes the bill to expire 15 years after a service member has left the military. The other is to allow veterans who have received administrative discharges to be eligible for the benefits. The Military Order of The Purple Heart also has a specific change in mind for the Post-9/11 GI Bill. “[We] would like to see all Purple Heart recipients get 100 percent regardless of the amount of time they served on active duty, and whether or not they were discharged due to their disability,” said Aleks Morosky, legislative director for the Military Order of the Purple Heart. Several of the veterans’ organizations leaders have expressed the importance of having a veterans’ center on college campuses. They said those centers are a great way to help the student vets transition from duty as well as give them a reliable community to go to with others in the same situation. “Really, I think above all of that, it’s the university signaling to student veterans and prospective veteran candidates, that their school really takes it seriously and wants to see them succeed,” said Hubbard. But what can others do to help spread the word about adjusting the GI Bill for the veterans? “Contact their elected officials and demand that these improvements be made to the GI Bill. America’s veterans have served their nation and the GI Bill enables them to transition to the civilian workforce and continue to serve their communities,” said Joe Plenzler, director of media relations of the American Legion.